Jim Goldsmith was a co-founder of No Barriers in 2003, and served as Board Chairman through mid-2008. He has been a passionate mountaineer for much of his life. 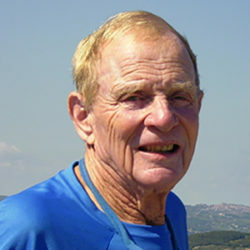 In addition to hiking and climbing in the Tetons, Sierra Nevada, and Wind River Ranges in the United States, he has hiked in many mountain ranges of the world including the Nepalese Himalaya; the Italian Dolomites; the mountains surrounding Merano, Italy; the French, Austrian, and Swiss Alps; the French and Spanish Pyrenees; and mountains in Wales, England and Scotland. In 1990, he and his wife, Anne, authored and self-published The Dolomites of Italy, the most comprehensive cultural and touring guide written in English. During his 50 year business career, he was a real estate consultant; asset and project manager of commercial real estate for companies including The Dillingham Corporation and four publicly-held companies in the United Kingdom, The Prudential Assurance Company, Ltd., Equity and Law Life Assurance Society, Capital and Counties, and The Fleming Mercantile Investment Trust; and the pension funds of Kaiser Aluminum, American Express and Fireman’s Fund. His interests include physical and natural history. His second wife, Connie, was an active No Barriers volunteer during its formative years. Jim has four children, three stepchildren and thirteen grandchildren.